Already known as a hazardous industry, coal investors exposed themselves to even more risk in 2014 -- many of which failed. NEW YORK (TheStreet) –- Coal mining is a hazardous industry and investors in coal companies exposed themselves to even more risk, betting this industry would rebound this year after posting 2013 losses of more than 18%. It didn't happen. With year-to-date declines of 10.81%, according to Fidelity, the metals and mining group was one of 2014's biggest laggards, trailing the 7.41% gain in the Dow Jones Industrial Average and the 12.03% gain in the S&P 500. In fact, with the Dow Jones U.S. Coal Index (DJUSCL falling another 32.98% on the year, according to CNNMoney, investors learned timing the bottom" is a dangerous game. Absent drastically improved business fundamentals, things can always get worse -- regardless of how cheap some of these shares may look. 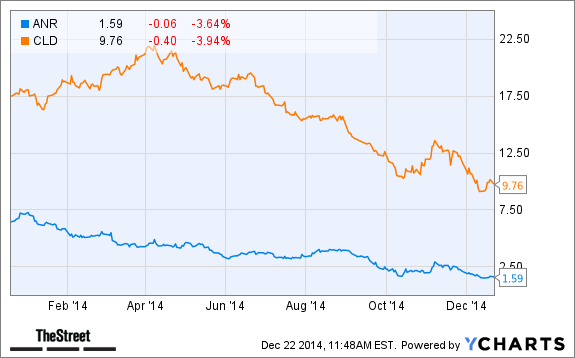 Are there any coal stocks worth buying? Yes, exactly one -- Consol Energy (CNX - Get Report) , the fifth-largest U.S. coal producer, whose losses have been nowhere as near as bad as its competitors. This company is actually growing revenue (up 10% Y/Y) and is buying back its stock. Consol's goal to enter the realm of natural gas, which is cheaper to produce and is more efficient, makes this the only name worth buying in 2015. But if you are interested in the other companies in the sector, which has plummeted 71.82% over the past five years, buyer beware. With declines of 60% and 59%, respectively, for the year to date, Peabody Energy (BTU - Get Report) and Arch Coal (ACI were two of the industry's worst performers. In 2013 both companies lost 29% and 42% of their values, respectively. That's not because the market their fundamentals were strong. In the most recent quarter, Arch Coal, which produces both thermal and metallurgical coal used in making steel reported shipments that jumped year over year, reaching 3.3 million tons of coal (1.9 million tons in thermal coal and 1.7 million tons in metallurgical). The company, which has seven active coal mines, said its Leer mine in Virginia has exceeded expectations while its Appalachian coal -- both thermal and metallurgical -- are already sold out for 2014. As for Peabody Energy, last week the company was named a finalist and one of the top two bidders for a contract to develop Tavan Tolgio, one of the largest coking coal deposits in Mongolia, which holds 7.4 billion tons of coal used to make steel. If Peabody, which is already the top coal producer in the U.S., can win this bid, it will be contracted to produce 30 million tons of coal a year in Tavan Tolgio, serving two coal markets with the region. Peabody has a media analyst 12-month target of $15. So are Arch Coal and Peabody worth the risk? For that matter, what about Alpha Natural Resources (ANR and Cloud Peak Energy (CLD - Get Report) , whose shares fell for the year to date by 79% and 46%, respectively. In the most recent quarter, Alpha Natural Resources, whose shares are trading for $1.60, posted revenues that declined 12% year over year. The company is projected to lose 2.63 per share for this fiscal year, and it is projected to lose $2.66 per share for fiscal year 2016, according to Yahoo! Finance. Cloud Peak, meanwhile, was upgraded by Brean Capital, which raised its rating on there shares to buy from hold and set a 12-month price target of $13. This suggest potential gains of 33% from current level of around $9.76. Analyst Lucas Pipes says "The risk/reward on Cloud Peak has tend more favorable." There was similar optimism going into 2014.